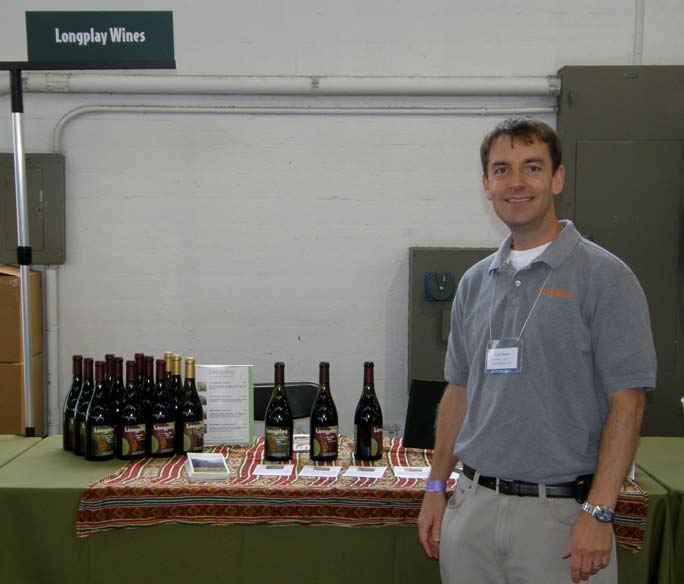 Young Todd Hansen is a new hound in the Pinot race and after spending some time speaking with him at Pinot Days San Francisco and IPNC, I believe he is a front runner. Foremost, he is a devoted winegrower assisted by noted viticulturist, Javier Marin, formerly of Shea Vineyard, who now operates his own vineyard management company. Todd’s Lia’s Vineyard (named after Todd’s baby daughter) is well situated in the Chahelam Mountains AVA at 380 to 560 feet with primarily a due south facing aspect. The vineyard was once part of the famed Rex Hill Jacob-Hart Vineyard. The soils are primarily Jory, with patches of sedimentary and loess type as well. 25 acres are planted to eight clones of Pinot Noir (Pommard, Wädenswil, Dijon 114, 115, 667, 777, 828, and Mariafeld) and 2 acres of Chardonnay (Wente Selection). The Pommard, Wädenswil and Wente Selection are all own-rooted with plantings dating back to 1990 to 1993. The newer plantings (1999-2002) are all on 101-14 rootstock, with 5’ x 9’ spacing and VSP trellising. The most recent plantings in 2009 are 3’ x 7’ and 4’ x 7’ spacing on RG, 101-14 and SO4 rootstocks. The vines are dry farmed. 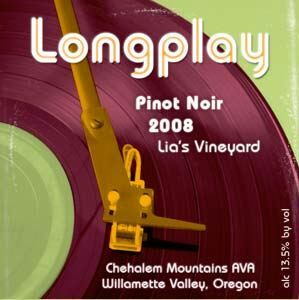 (More information on the Lia’s Vineyard is available on the vineyard’s website at www.liasvineyard.com). 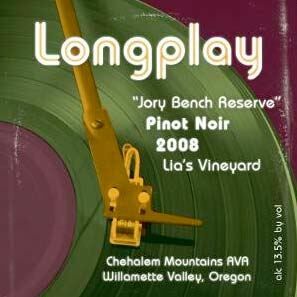 Todd produces a small amount of Pinot Noir and Chardonnay under the Longplay label. With my interest in old vinyl (I have an extensive collection of LPs and 45s from the 50s and 60s), the label really appeals to me. The winemaker is veteran Aron Hess, who crafts several labels at 12th and Maple Wine Co., including his own label, Daedalus Cellars. Todd asked me to review three of his wines and I was happy to do so. This is a project that holds considerable future potential. The wines are fine now, and worthy of your interest, but I believe the best is yet to come. 14.5% alc., pH 3.69, 63 cases, $24. 17-year-old vines. Aged 16 months on the lees in neutral oak. Low-yielding own-rooted Wente clone. · Lovely array of scents including apple pie, white peach, dried mango and marzipan. 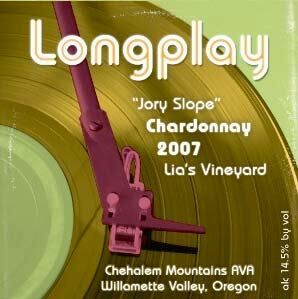 Very tasty green apple, white stone fruit and citrus core with an appealing hint of yeast. Pleasantly creamy and finishing with a spark of acidity. Proof positive that Wente clone can produce high quality Chardonnay in the Willamette Valley. Very good. 13.5% alc., pH 3.95, 287 cases, $24. 55% Dijon 115, 20% Wädenswil, and 10% Mariafeld clones. Indigenous yeast fermentation. Aged in 10% new French oak barrels for 10 months. · Darker fruited scents with a floral note and an underlying roasted coffee aroma. Moderately rich essence of black cherries with a fine grain texture and a dry finish. Simple and easy to drink. Good. 13.5% alc., pH 3.95, 287 cases, $30. Four barrels in the cellar stood out composed of 25% Pommard, 25% Wädenswil, 40% Dijon 115, and 10% Mariafeld clones. Aged in 20% new and 80% seasoned French oak barrels for 10 months. · Demure fruit on the nose with a roasted coffee, toasty bent. Earth-kissed dark fruits with tar and coffee mocha notes. Still tight and significantly better the next day from a previously opened and re-corked bottle showing tasty black cherry essence with a subtle toasty oak tone. Definitely worth revisiting with another year or two in bottle. Good (+).